Lately, the moment I walk into Whole Foods (which, by no accident, puts me directly in the produce section) my eyes dart around to the butternut squash, sweet potatoes, and apples. I want to race around the store Supermarket-Sweep style and pile my cart with these cozy fall foods that make me feel like home. But this week, something different happened. My eyes lingered longingly on the zucchini…and the tomatoes…and the peppers. Summer. Was I ready to abandon it so soon? The weather sure hasn’t. With temps back up in the mid-70’s here in Chicago, it has felt more like June than September. Standing somewhere in the confusion between the corn and the pears, I had a moment of clarity: I was going to ditch the meals I had planned for this week and make one last goodbye-to-summer dinner. I picked up whatever veggies appealed to me most. Yellow squash. Cherry tomatoes. Sugar snap peas. Yellow and orange bell peppers. Mushrooms. Broccolini (a recent obsession). Many of them were local, too (Wisconsin and Indiana if that counts). It made me feel a little better about what I was doing, knowing that the crops in my region were still offering whatever remained of the crisp taste of summer. When I got home, I still didn’t know what I was going to make. A salad sounded too obvious, plus I had had one for lunch. Stir-fry? Made that on Friday. What’s something that would pair nicely with this bounty of veggies while allowing the clean flavors to soak up the spotlight? I got it—fish! Mild, flaky white fish. I opened the freezer: cod and halibut. Score! The rest, I suppose, unfolded from there. 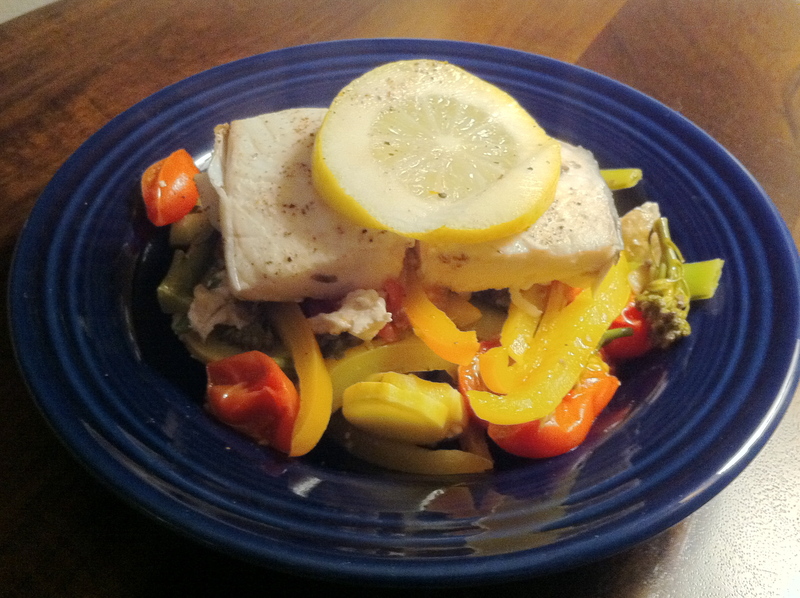 I decided to make packets – layering the veggies (first flavoring them with olive oil, lemon juice, white wine, salt and pepper), then the fish, and topping it with lemon slices. (Added bonus: Using foil means minimal cleanup.) Honestly, I wasn’t even sure I’d share the result here because when I completely make up a recipe the outcome tends to be edible, but questionable. (Cooking has never been intuitive for me.) But this time was different. So different. I achieved exactly what I was hoping for: A meal that tasted like the middle of August. One last time. 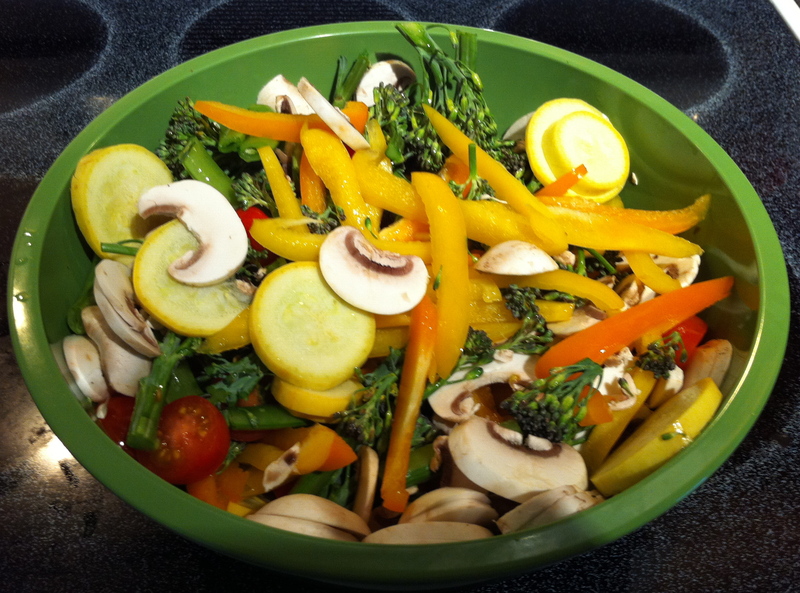 Place all cut veggies in a bowl. Add olive oil, white wine, juice of 1/2 a lemon, salt and pepper and toss to coat. Starting with one slice of foil, place a pile of veggies in the middle. Top with one fish filet. Season filet with salt and pepper and top with two lemon slices. Fold into a packet. Repeat with the remaining pieces of foil. Place two packets each on two baking sheets and bake for about 20 minutes, until fish flakes easily with a fork. Using a spatula, transfer fish and veggies to a bowl and pour juices that have collected on top. This entry was posted in Fish on September 21, 2011 by Paige Greenfield.